AUDUBON The weekly Irish music session at the Tree House in Audubon always begins with "Merrily Kissed the Quaker's Wife," a tune that's sufficiently merry to chase the chill away, even during a winter like this one. A session, from the Gaelic seisiún, is a regularly scheduled but otherwise informal live performance, often in a pub; at the coffee house on Merchant Street, the youngest players are teenagers, the oldest is an octogenarian, and newcomers of any age are welcome. The spirit that energizes the circle of music-makers in mismatched chairs is communal and contagious. I can't help tapping my feet. Last Thursday, as usual, the loose-limbed acoustic jam - featuring fiddlers, flutists, guitarists, tin whistlers, and bodhran players - was led by Dennis Gormley and Kathy DeAngelo, a husband and wife from Voorhees whose commitment to teaching, performing, promoting, and preserving traditional Irish music spans nearly four decades. 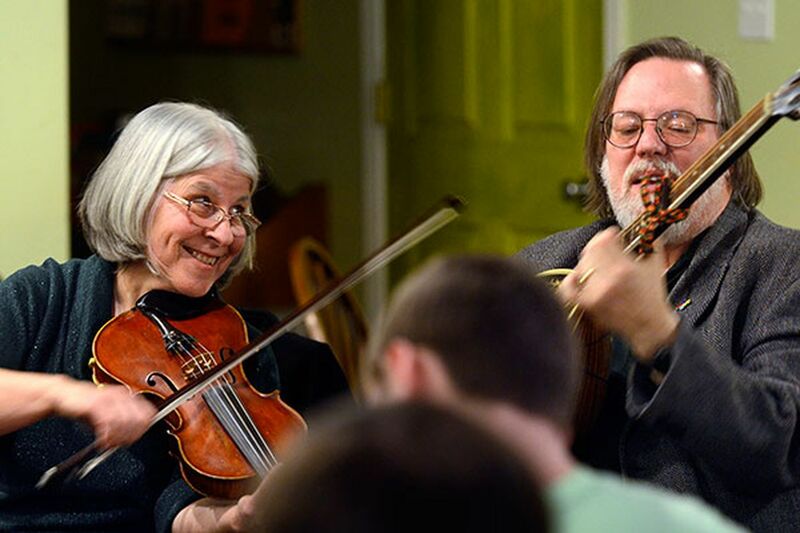 The couple founded the session at a Haddon Township restaurant in 1992, making it "the longest continuously running session in New Jersey," says DeAngelo, 60, who along with her husband recently was named to the Mid-Atlantic chapter of Comhaltas Ceoltoiri Eireann Hall of Fame. Loosely translated from Irish Gaelic, the international organization's name means "gathering of Irish musicians." "Dennis and Kathy are tireless, especially in their work with young musicians," says Katherine Ball-Weir, a West Chester, Pa., resident who is chairman of Comhaltas' Delaware Valley chapter. She's also the mother of Alex, 15, an accomplished fiddler and student of DeAngelo's. When Gormley and DeAngelo are inducted into the Hall of Fame at a ceremony April 25 in Parsippany, "they'll be standing with the giants of Irish music," Ball-Weir says. Previous inductees include guitarist-author-educator Mick Moloney, John Vesey ("the Sligo fiddler"), and flutist Joanie Madden, longtime leader of the band Cherish the Ladies. "This is an incredible honor," says Gormley, a computer technician and Irish music teacher who plays guitar and flute and grew up in Camden County. "We're [joining] a list of people who are our idols, who are icons," his wife says. DeAngelo, who hails from Monmouth County, is a harpist and fiddler whose first instrument was the accordion ("I'm Italian," she quips). She teaches music privately and organizes the annual Somerset Folk Harp Festival in Parsippany, an event she describes as the biggest of its kind in the country. Gormley and DeAngelo began playing Irish music together in 1977 after both were mentored by the respected New Jersey fiddler Ed McDermott. He died that year at age 75; they honor his legacy as the performing and recording duo McDermott's Handy. "This music fits me," says Gormley, who earlier performed other types of popular music. "It feels like home." He and DeAngelo married in 1977, and their daughter, Emma, 26, of Voorhees, plays fiddle in an all-female South Jersey traditional Irish music trio called the Peacock's Feathers. Families figure prominently in vernacular Irish music, which is traditionally learned and played by ear, often in communal settings. "Ed McDermott taught us, and he learned from his father, who went back at least to the middle of the 1800s," Gormley says. "Look ahead, and our daughter will go well into the middle of this century. So from where we stand, we can see at least a two-century span for this tradition." In 1998, after arranging a successful session for young players at the Garden State Discovery Museum in Cherry Hill, Gormley and DeAngelo established the Next Generation of Traditional Irish Music, a Sunday afternoon program at the Irish Center, a.k.a. the Commodore Barry Club, in Philadelphia. It's a chance for kids to hear and make traditional Irish music in a supportive, collective atmosphere. "This kind of music shouldn't be a solo endeavor," DeAngelo observes. At the Audubon session, Mike Glennan, 18, of Mantua, usually plays flute and tin whistle with his brother Patrick ("Patch"), a fiddler. Bob, their dad, is a retired New Jersey state trooper and a guitarist (Gormley was his teacher); father and sons often play together at the Aubudon sessions. "It's really awesome to have people in your family play together," says Mike, a senior at Gloucester Catholic High School, adding that "the greatest thing about the music is the community." Elsewhere in the circle sat Dave Field, 82, a Collingswood resident who's a regular and builds dulcimers. "This one is No. 397," he says, noting that while his is not a traditional Irish instrument, its sound works nicely with the music. "Dennis and Kathy keep this group going," Field says. "They keep us on the ball." Although the two-hour session has an easy, improvisational quality, the 14 people in the circle are passionate enough about Irish music to venture out in the frigid dark of a winter weeknight. And it turns out there's an educational element at work as well. "The middle is what everybody wants to play, but we always start with the same jig set and end with the same jig set, so [newcomers] can feel like they're learning and participating," DeAngelo notes. "We're busy transmitting the music," she says. "That's our mission."